With the GA release of VMware VSAN, the latest update of Horizon View 5.3.1 now supports VSAN datastores as location of Horizon View desktops (full and linked-clones). There is no other enhancements or new features in Horizon View 5.3.1, just the VSAN support, which allows running VDI workflows on VSAN clusters. By default VSAN does thin provision disks. VSAN simplifies the managing storage. The procedure for activating VSAN has been reduced to the minimum, so integration of VSAN with Horizon View 5.3.1 just makes sense. Having highly performance location for VDI is main problem of any VDI solution today. Previous versions of View won’t be able to leverage VSAN datastores, you must update your Horizon View installation to the latest version – 5.3.1 which brought the support of VSAN. To migrate from non VSAN datastore to VSAN datastore? Edit the pool to deselect the old datastore and select the Virtual SAN datastore instead, and use the Rebalance command. 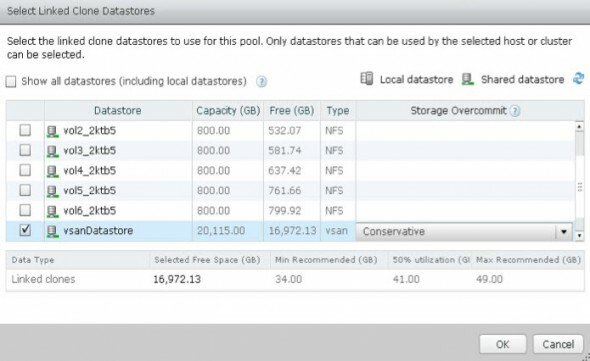 Edit the pool to change the Datastore from the existing location to the new location on VSAN Datastore. Sparse disks aren’t supported in this release. (disks which can automatically reclaim dead space from thin disks). You can check what are sparse-efficient disk formats in my post here. No VAAI support – VSAN does not support VMware vSphere storage APIs, so VAAI feature does not use NAS devices. VMware allows reducing CAPEX by 50% when View is used with VSAN 5.5.